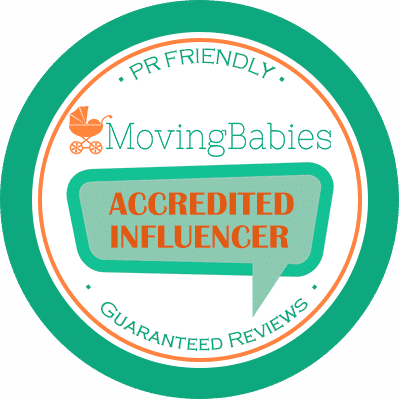 Every time I interview a Mom Entrepreneur, I fall in love with them and their ideas. Each Mompreneur I’ve interviewed has had unique qualities that have made them successful. 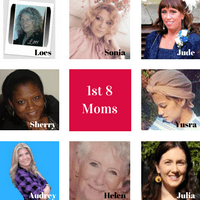 In this collection of stories of the first 8 Mompreneurs featured, I’m going to do my best to encapsulate what I feel made each Mom successful. Let’s start with the first interview I conducted and go in date order. If I had to choose one for Loes, it would be Productive. Loes has 6 children, 3 grandchildren, a full-time job running a daycare centre from home, she teaches Dutch to refugees 3 mornings a week and manages 6 websites. 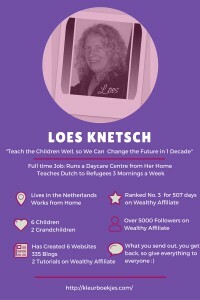 Loes has also written 524 blog posts and created 90 Training Tutorials on Wealthy Affiliate and is always honing her skills and then sharing her knowledge with the community. How does Loes manage to be so productive? In her words, “You need discipline and perseverance”. When I think of Sonia, the word that comes to mind is Strength. Sonia had the strength to tough it out as a Single Mom, making sure her children never felt a dip in income when their father left. 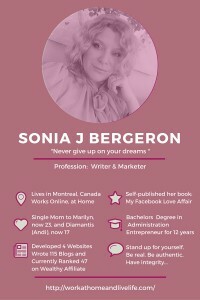 Sonia has a marketing business, 4 websites and has self-published a book. And in this blog post: Why Aren’t You Achieving Success Like Others? Her answer: Because we don’t stand up for what we believe in. I’ve been struggling to choose one word for Jude, it’s either Positivity or Motivational. 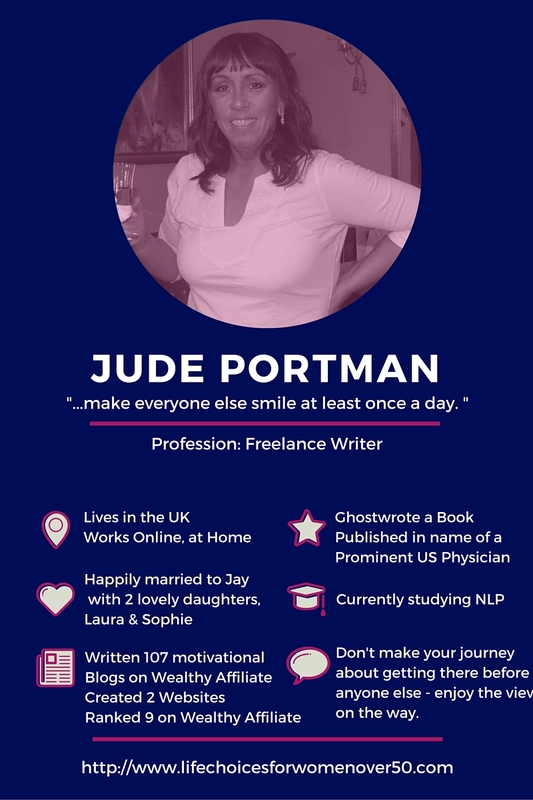 Jude always comes across as light-hearted and funny, even though she battles with a number of health issues, including degenerative disc disease that means she has to work with her feet up. Her advice for new entrepreneurs probably describes what makes her successful. Surround yourself with positive, like-minded people as that will attract positivity into your life. If you have people telling you that you ‘can’t do it’ or ‘you haven’t got any skills’ then that says more about them than you – you don’t need that kind of negativity. When I think of Sherry I think Enthusiasm. Sherry has so much energy and drive, it’s remarkable. 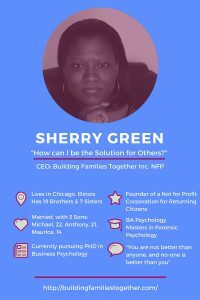 She’s founded a Not For Profit Corporation for returning citizens called Building Families Together, Inc.
Easy by far. It’s difficult because, of course, as you know, you can stay up nights, you can work into the wee hours of the morning on your project. But when you go to bed you’re happy, you’re satisfied, you have a smile on your face. Sometimes you might have tears in your eyes because you’re so happy! Don’t be part of the problem, be part of the solution.And I want to take problem out altogether. The mind can’t concentrate on the reverse of an idea. So if you take the word problem out completely, and you think of solution. So… I want to be the solution. How can I be the solution for others? That’s my message. My one word for Yusra is Passion. In becoming a Mom, Yusra discovered a passion for the early stages of motherhood – pregnancy, birthing & breastfeeding. This passion prompted her to create products for new mothers like lactation cookies, cotton nursing covers, muslin blankets and baby wraps, and then to become a Doula. Start. Have faith in your work, your ideas, never lose that passion. If you do, then go back to the beginning and rework those steps. If one part doesn’t work out, don’t give up things always works itself out in the end. 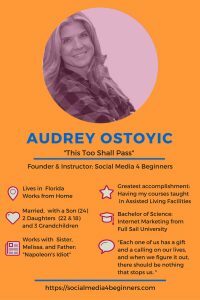 Audrey homeschooled her children, discovered her gift and calling was to teach and successfully turned it into a business, Social Media Training Courses for Beginners. When you find what you’re really good at and love doing, I’d say go for it, you’ll always find a way to make money. 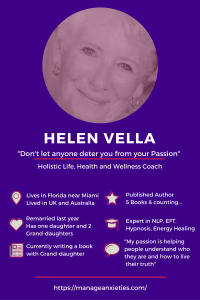 Helen is Life Coach trained in NLP (Neuro Linguistic Programming), EFT (Emotional Freedom Technique) and Hypnosis. She’s also written 5 books and has 2 websites. Helen is impeccable in everything she does. A coach who walks her talk. She works with the highest integrity. Helen attributes her success to being self-motivated, knowing her niche and becoming an expert in her field. Know your Passion. Make sure that you know that it’s hard work. It’s not a 9 to 5 job, it’s 24-7, because as you know, you can have an idea pop into your head at 2 in the morning, and you get out of bed and you have to do something about it. I think there are two very strong attributes of Julia that have made her successful. One is that she is inventive and the other is she is collaborative. 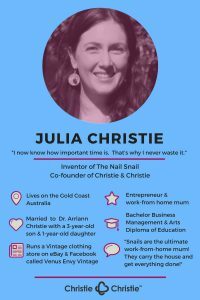 Julia is not only good at engineering something entirely new, Then Nail Snail baby nail trimmer, she also very cleverly includes others in her process and is great at getting the word out. She infuses others with the same passion she has for her product. She is aware that she cannot do this alone. Wherever possible, Julia hires work from home Moms to assist her in her business. Because we are an amazing force of intelligent, hardworking, passionate, educated women who want to get things done. And we have these brilliant ideas, and I think we’re an incredible resource, we make the world so much better. Hire people that know more about it than you do. Don’t try do everything, because you just can’t. 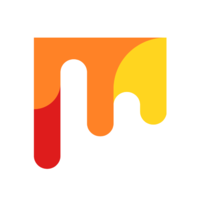 Even though you know your product better than anybody. I hope that these success stories have inspired you and prompted you to think of what makes you uniquely successful? If you had to choose a word to describe yourself, what would it be?